Godzilla is all of us in the mornings. James Wan returns to horror with a sci-fi twist on the killer doll trope. Henry Cavill is still telling us what he wants out of a hypothetical Man of Steel sequel. The Y: The Last Man TV show adds an intriguing character. Plus, new pictures from Doctor Who, and what’s to come on The Originals. To me, my spoilers! 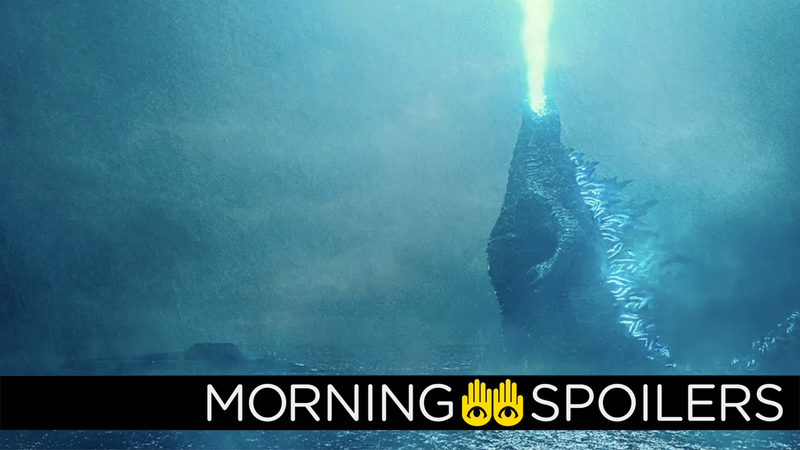 Millie Bobby Brown does not love scanning for lifeforms in a clip from the Godzilla sequel’s upcoming trailer. Meanwhile, the film’s tie-in website has been updated to include several images teasing Rodan, Mothra, and King Ghidorah. Head over to ScreenRant for more unearthed pictures and statistics from Monarch Sciences. In related news, a second sequel to The Conjuring spinoff was recently announced by James Wan and director Gary Dauberman at Comic Con. MI6 claims to have casting calls for the film’s lead Russian antagonists and their Māori henchman. Michael Mando teased a Scorpion-related announcement is forthcoming at San Diego Comic Con... despite the fact that Marvel Studios won’t really have a major presence at the convention this year. Sony’s Bloodshot opens February 21, 2020 according to Coming Soon. Coming Soon also reports Zombieland 2 is set to hit theaters on October 11, 2019. Speaking with Entertainment Weekly, producer Peter Safran answered, “We have plans in place for sequels that take into account those realities” when asked how the franchise hopes to handle 15-year-old star Asher Angel’s march to adulthood. Speaking with Fandom, Henry Cavill stated he’d like to see Superman take on Brainiac in a potential sequel to Man of Steel. A hot cross nun blazes her way through a new poster from Coming Soon. Bruce Willis returns as David Dunn in another teaser leading up to the eventual trailer. The second trailer for Robert Zemeckis’s fantasy psychodrama has dropped, just in time for the 20th anniversary of Small Soldiers. A mysterious cosmic event turns half the population into human vapor in the first trailer for I Still See You, starring Bella Thorne and Dermot Mulroney. Deadline reports Laura Vandervoort, Kyle Breitkopf and Kimberly-Sue Murray have joined the cast of Netflix’s upcoming vampire drama as characters named Mila, Dez and Danika, respectively. Deadline reports Fox 21 TV Studios and producer Warren Littlefield (Fargo, The Handmaid’s Tale) will team on an adaptation of Adam Glass’ sci-fi horror series The Normals published by AfterShock Comics. The series concerns a family man discovering his perfect life is merely an illusion. The first two episodes of season five are titled “Nora” and “Blocked,” according to Spoiler TV. Spoiler TV also has a terse synopsis for the season finale of Colony. Delle has John dead to rights in pictures from episode two of season four, “Johnny Dangerously.” More available at Spoiler TV. Darkseid and Vandal Savage appear on a banner at San Diego Comic-Con. Luke Cage promises to never dab again on the show’s official Twitter page. The BBC has released three new images from Jodie Whittaker’s inaugural season of Doctor Who, which appears to include an adventure set amidst the redwood logging industry. Finally, the CW has released a trailer for “The Tale Of Two Wolves,” the penultimate episode of The Originals.